High-density video surveillance solution with H.264 and full audio support. 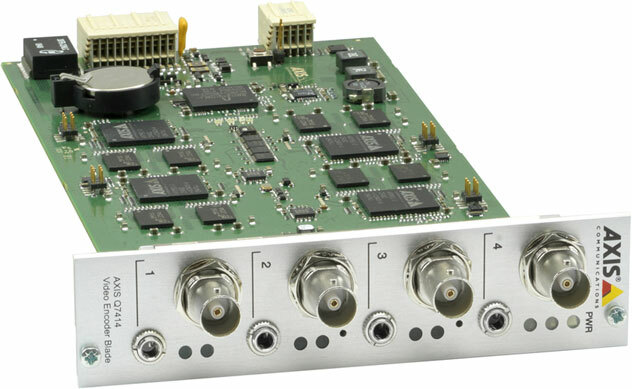 Axis Q7414 Video Encoder Blade is a 4-channel blade for video encoder rack solutions, enabling large numbers of analog cameras and audio channels to be integrated into an IP-based, high-density video surveillance system. When Axis Q7414 Video Encoder Blade blades are used with AXIS Q7900 Rack, up to 56 analog cameras can be supported in one 4U, 19-inch rack. Axis Q7414 Video Encoder Blade offers intelligent capabilities such as enhanced video motion detection, active tampering alarm and audio detection. The encoder"s external inputs and outputs can be connected to devices such as sensors and relays, enabling the system to react to alarms and activate lights or open/close doors. The Axis 0354-001 is also known as AXC-0354-001	or 0354001	.